Peacocks are the boys and peahens are the girls among peafowl. Many folks are surprised to learn that there are three species of these omnivorous relatives of the pheasant. 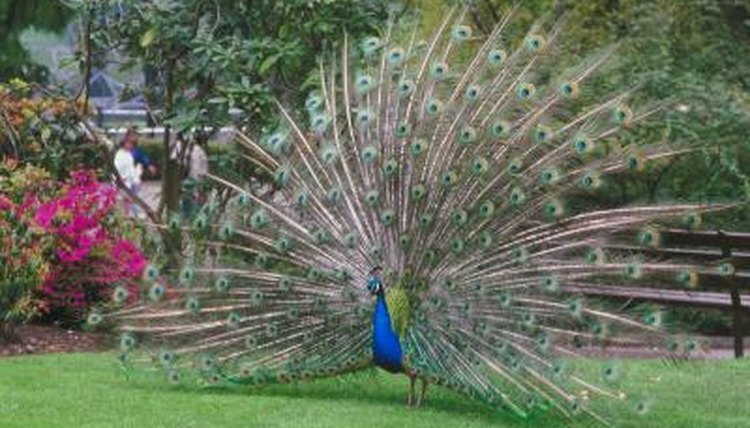 The most familiar is the blue, or Indian peacock (Pavo cristatus) of India and Sri Lanka. Burma, Indochina and Java are the native lands of the green peacock (P. muticus), and the Congo peacock (Afropavo congensis) hails from Central Africa's Congo basin. Wild peafowl are ground feeders who scratch around in leaf litter to find most of their food early in the morning and around dusk. These birds aren’t picky and actively hunt insects, arthropods and small rodents, mammals, amphibians and reptiles. They forage for fruits, berries, seeds, grains, wild figs, drupes, seed heads and flower petals, and are known to feed on cultivated crops as well. Domesticated peafowl do well on a regular diet of poultry pellets and mixed grains such as wheat, barley and rice. Because they enjoy a wide variety of foods, they’ll thrive best with additions of animal and plant products daily. Peafowl love proteins such as mealworms, legumes and meats, as well as veggies including dark leafy greens, broccoli, grated carrots, beans, beets and peas. They also relish fruits, dried dog food, multi-grain breads and pasta. A container of grit should always be available, as these birds swallow food whole and need an internal aid for grinding it up.